The 537 GLS Concealment Open Top Belt Slide Holster is no stranger to the signature life-saving safety standard of Safariland, which is industry trusted and renowned by professionals like you. The 537 concealment holster features Safariland's coveted GLS (Grip Lock System) for automatic firearm secure carry when you holster the weapon, yet it allows for a quick and effortless draw using one's middle finger in a typical shooting grip. The material is soft enough to conform to the shape of the wearer, maximizing your comfort potential. The tension is fully adjustable for both your weapon and your personal preference. Gun slinger's beware: this concealable optimizes the good guy's grip for both accuracy and efficiency of the aim. Safariland 537 GLS Open Top Concealment Belt Holster never disappoints! 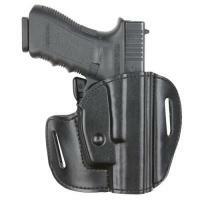 This holster is a comfortable fit, locks in and secures the gun with no problems.